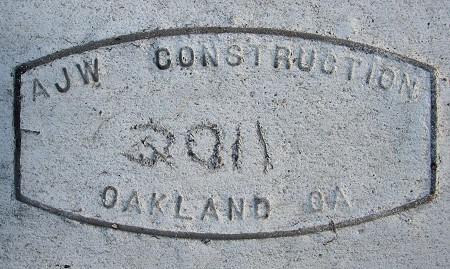 AJW Construction patched the sidewalks of Shafter Avenue from 51st Street to College Avenue, so this mark is abundant there. I was a little worried that they had stopped stamping their work after 2006. This entry was posted on 17 June 2013 at 12:05 am and is filed under 2011. You can follow any responses to this entry through the RSS 2.0 feed. You can skip to the end and leave a response. Pinging is currently not allowed.